The APPA-REAL database contains 7,591 images with associated real and apparent age labels. The total number of apparent votes is around 250,000. On average we have around 38 votes per each image and this makes the average apparent age very stable (0.3 standard error of the mean). The images are split into 4113 train, 1500 valid and 1978 test images, provided in the folders train/, valid/ and test/. For each image X.jpg, we also provide a corresponding X.jpg_face.jpg which contains the cropped & rotated face with a 40% margin obtained from the Mathias et. al face detector (http://markusmathias.bitbucket.org/2014_eccv_face_detection/) at multiple rotations. Furthermore, an X.jpg.mat file is provided with meta-information about the detected face. The real age and apparent age ratings are provided in the files gt_train.csv, gt_test.csv and gt_valid.csv, with a separate row for each rating. Furthermore, we provide per-image summaries in gt_avg_train.csv, gt_avg_valid.csv and gt_avg_test.csv, showing the number of ratings, average apparent age, standard deviation of apparent age and the real age for each image. 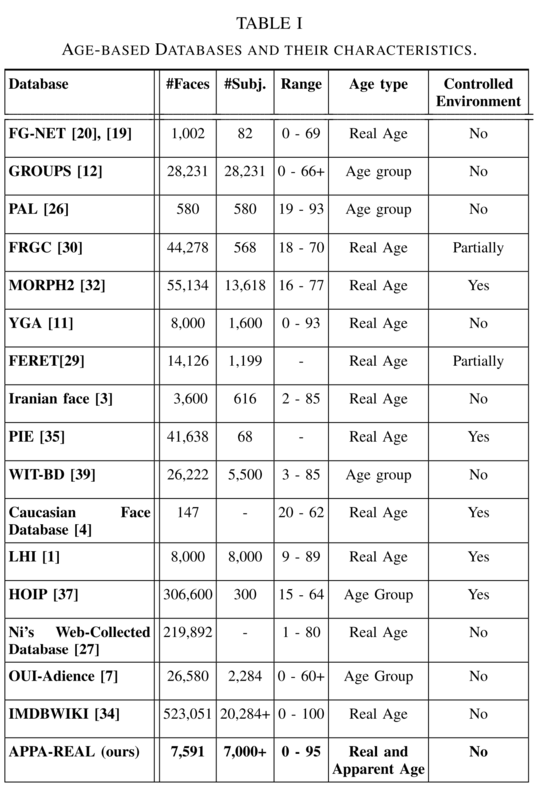 A comparison of Age datasets characteristics is shown in the table 1. You can download the whole dataset here. Extended annotations for the dataset, including ethnic, makeup, gender, expression, among others. Download extended dataset annotations here.